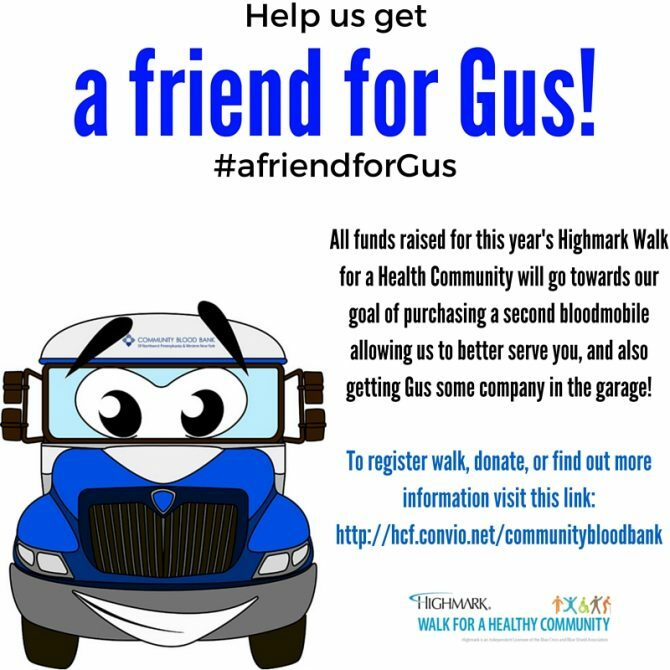 A Friend for Gus: The Final Month Before Walk Day! As many of you know by now, this walk will allow us to raise money which will be put towards the purchase of a second bloodmobile. This second bloodmobile (a friend for Gus, our current bloodmobile) will allow us to better serve our donors by giving us the ability to hold more mobile drives than what our current resources allow. You haven’t forgotten about the perks, have you? Once you’ve registered to walk, if you raise $20 you’ll receive a t-shirt from CBB! If you raise $30 you’ll receive a t-shirt from Highmark in addition to the t-shirt from us! And the first 100 walkers will receive a reusable water bottle from CBB! Oh, and did we mention that Highmark is giving away prizes too? They announced their prize list last month, and we have to say, this year’s prizes are pretty cool! They range from a bluetooth speaker, to a Roku streaming stick, various Apple products, two different types of Fitbits and more! For every $50 a registered walker raises/donates, you’ll be given a chance to win one of these prizes from Highmark! So let’s tally this up. If you register to walk and raise at least $50 you’ll receive a water bottle, two t-shirts, and a raffle ticket to win one of Highmark’s big prizes! That’s a lot of goodies! As part of our wrap-around fundraising for the Highmark Walk we’re holding a silent auction, which will culminate after this year’s Donor Dinner. Bidding will operate through our website (www.fourhearts.org) and will go live on Monday, May 2nd in the afternoon. Keep your eye on our social media pages and on our website for go-live, bidding will close at 11:59 p.m. on Friday, May 13th. Items for the auction include Erie Otters prize packs, a Wegman’s gift basket, jewelry and a very exciting something from Five & 20 Spirits and Brewing in Westfield, New York! The celebration of our 50th Anniversary continues all year long and over the next few months it’s all about the points, promos & pints! Interested? Great! Then make sure you’ve opted in to receive text messages from us as we’ll be announcing exclusive details via text over the coming weeks and months! To opt in to receive text messages, you just need to text the word BLOOD to 444999. And don’t worry, if you don’t use texting we’ll still announce the basic details via social media & email. Our ability to reach you quickly isn’t just about promotions, it’s also about patients in need. According to MobileSquared, over 90% of text messages are read in three minutes, compared with just 22% of e-mails in that same time frame. That means that when your blood type is needed and we need to reach you, doing so via text message will notify you quicker, giving you more time to find a blood drive near you or get to our Erie Donor Center. Thank you to our GR8 GIVERS groups from this month: Zurn Industries, St. Jude Church & FedEx Ground! As a reminder, GR8 GIVERS takes place year round, and groups can consist of family, friends, co-workers, neighbors, classmates or members of your church. Once your group of 8 (although more are always welcome!) have signed in and donated during your selected week, you’ll automatically be entered into a drawing for a $100 gift card for breakfast or lunch for your group! Already have your group selected? Simply contact Deanna Renaud, Director of Donor Services for Community Blood Bank, at drenaud@fourhearts.org OR at (814) 456-4206 to reserve your week! Congratulations to Paula who won the $100 gift card in March! Interested in winning? One winner is selected at random fromour point store drawing each month, you can enter as many times as you’d like each month OR you can redeem your points for something tangible like a coffee mug, t-shirt, or gift card. Your points are yours to use as you’d like, happy shopping!